A pair of former IBF 140 lb. titlists put on one of the best fights of 2019 in the welterweight division on Sunday night at the MGM Grand National Harbor in Oxon Hill, Maryland. 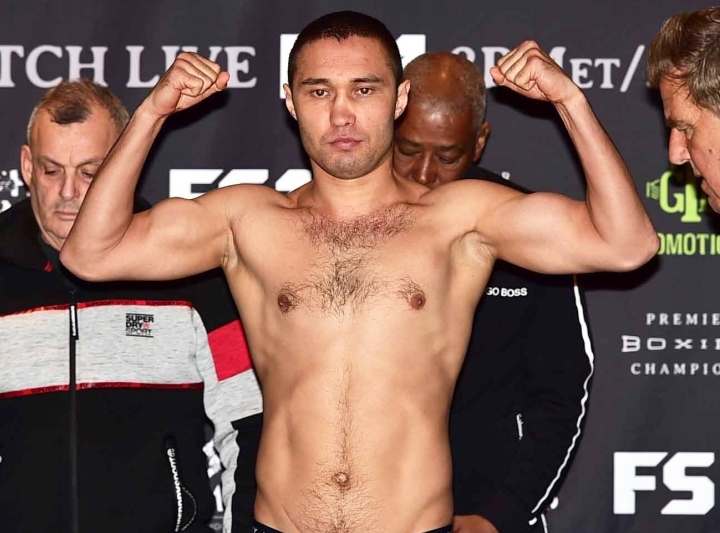 In the end, youth mattered as 29-year old Sergey Lipinets (15-1, 11 KO), 147, of Martuk, Kazakhstan dropped and stopped 34-year old Lamont Peterson (35-5-1, 17 KO), 145 ¾, of Washington, DC. It was the third stoppage loss of Peterson’s career and second straight after a defeat in January 2018 to reigning IBF welterweight titlist Errol Spence Jr. Peterson announced his retirement in the ring after the fight. Lipinets wins his second straight in the welterweight division after losing his Jr. welterweight title to Mikey Garcia by decision in March 2018. The referee was Harvey Dock. For the first three rounds, Peterson used his length and a little edge in quickness to appear to take a lead in a fight rapidly resolved to close quarters. The younger man slowly got stronger and in the fourth Peterson showed signs of fatigue. It carried into the fifth when Peterson then found some energy and started firing back hard to the ribs. In an odd occasion, the bell rang to end the round and both corners entered the ring only for the timekeeper and referee to say the bell had been rung early and action would have to resume for roughly another minute. Peterson’s trainer Barry Hunter gave the timekeeper his opinion of the matter before both men resumed beating on each other at ring center for most of round six. Peterson landed echoing body shots while Lipinets landed a particularly eye-catching shot to the head that buckled Peterson’s back leg. It was more of the same in the seventh and then a big turn in momentum elevated the drama of the fight. In round eight, a Lipinets right hand sent a shudder through the frame of Peterson who barely kept his feet. Another shot near the ropes had Peterson in big trouble and the Kazakh came on. Using token offense, his feet, and just enough guile and defense inside, Peterson survived and then contained a Lipinets who was finding him easier to catch to the head with rights and lefts in the ninth. In the tenth round, the fight and perhaps the career of Peterson came to a close. On sheer will, Peterson was outworking Lipinets but the younger man was simply letting his elder empty the chamber. Landing with authority in spots, Lipinets chipped away until finally Peterson could take no more. A right sent Peterson towards the ropes and Lipinets attacked and sent Peterson to the floor. Peterson’s corner tossed in the towel almost as soon as their man went down. Dock waved off the action at 2:59 of round ten. At the time of the stoppage, Peterson had outlanded but been slightly outthrown by Lipinets in a contest where both men launched nearly 1,000 blows according to official punch stats. It was indicative of what both men gave and ultimately still not enough. Fans on Sunday night were treated to the sort of brutality fans in any era can appreciate. Peterson has had a lot of nights like this one, win and lose. That he went out on his shield in one more, at home, was only fitting. Watching the rerun right now, on round 6. This is a really good fight. Lamont has nothing to be ashamed of.